I'm lucky because I have a friend in the fabric business. Julie and I are both members of the local modern quilt guild and you can just imagine the happy chatter that goes on between a fabric fiend (me) and a fabric shop owner (Julie). I thought I knew a lot about fabric, but Julie knows even more! The members of our guild keep trying to stump her with fabric questions and we haven't been able to...yet. Imagine sharing a quilt at a guild meeting and someone asking, "what's the name of that green fabric? ", puzzled looks all around while we try to remember the name of it; then Julie saves us by naming the designer, the fabric line, and the release date. She sure knows her fabric!! Even more than that she is an incredibly kind, funny, generous woman and a good friend. 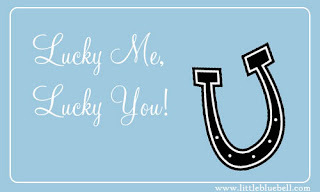 Super lucky I tell you. Do you want to know why are you are so lucky? 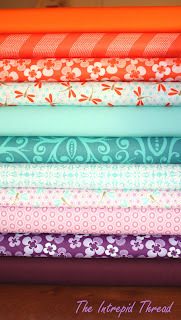 Remember the other day when I went fabric shopping for my latest project, Peaceful Pagoda? Well, Julie is giving away a custom bundle inspired by that post!! AND it's available in her shop so you can get some and make your own Peaceful Pagoda project! **Edited to add: The dragonfly print is from Kate Spain's new line, Good Fortune. It's called, Tranquility Dragonfly. Here it is in aqua and lavender. There are names and links to all of the prints I bought from Julie in my post, Peaceful Pagoda. 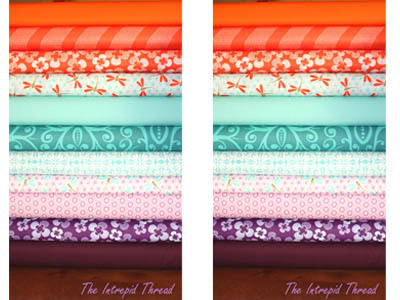 The Intrepid Thread is giving away a custom bundle of 11 Fat Quarters. It's super easy to enter and everyone has three chances to win. International entries are welcome. One winner will be chosen randomly next Friday, February 10th. The winner will be contacted via email. Please make sure your email is visible in your profile or added to your comment. Edited to add: I will be choosing a SECOND WINNER on Friday. Kate Spain has offered to give away a Good Fortune jelly roll!! w00t!! Edited to add: Even more good news!! There have been so many entries, Julie is giving away another custom bundle. That means I will be choosing a THIRD WINNER on Friday!! Yahoo!! Thanks so much Julie and Kate! 1) Leave a comment below, it can be anything. Maybe share your favorite print from the bundle? You don't have to know the name or anything, just shout out, I love the dragonflies and I will know exactly what you mean. 2) Show Julie some love!! If you follow The Intrepid Thread blog, please leave a second comment. 3) My followers get another chance too. I Love you guys!! If you follow my blog (either here or in your reader), please leave a third comment. That's it. Good luck everyone!!! That is a lovely stack. I could see this being a very nice tumbler quilt. Something simple to show off those lovely colors and prints! I love the blue and orange dragonflies! And I am your follower! Thats such a pretty stack! I love the orange/aqua/purple colour scheme! I'm a follower :-) Thanks for the chance to win! Good Fortune, Tranquility Lantern Flower, Aqua - this is my choice :) Thanks for the beautiful giveaway. The dragonflies !! They are beautiful ! And I follow your blog !! What a nice giveaway! I like the purple flowers the best...or maybe the orange flowers...ooohhh and the orange winged dragonflies are very cute! I love this bundle! The prints are darling and I really like that deep purple. Lovely giveaway! I like the dragonfly fabric, too! I'm a follower of Intrepid Thread! I follow The Intrepid Thread. I'm a follower of your blog also! I follow this blog, too. :) Thanks! And I am now following "The Intrepid Thread"!! I'm not kidding Adrienne.....I love the dragonflies..
Of course I follow you blog! I follow Julie's intrEpid Thread blog. I love the purple with the flowers! Beautiful fabric. I think the fireflies are my favorite. Thanks for the great giveaway! I"m a big fan of the orange/purple combo - I like the purple flower print at the bottom of the stack. How cool that there is a custom bundle inspired by you! id love a chance to win! I love the dragonfly too!!!! You inspire me a lot!!!! I love the purple flower!! I follow Julie's blog!! She is totally awesome!!! I follow your blog as well and love it!!! I love the little dragonfly print! and I follow Intrepid thread too! i love the oval elements. they're dots but they're more than that. exquisite! no wonder they keep getting released in new shades! Of course I follow Julie. And I want to buy fabric just so I can receive a note addressed to "mistress Duff" again!! love her! Lovely!!! Love the flowers on purple! And I am a follower of Julie too! Thanks so much! I love the orange flowers! So pretty! I'm now following Julie. Thanks for introducing me to her wonderful shop! Such a beautiful colour combination! I love those dragonflies! Thanks for the chance to win. Gorgeous bundle! Like many others, I like the dragonflies. 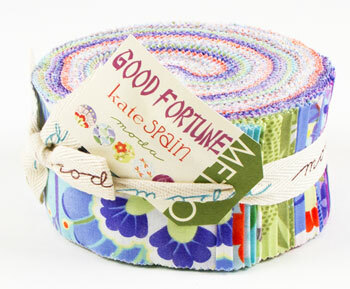 I've been drooling over Good Fortune fabrics ever since I first saw a picture of them, and some of my favorites are in this bundle! I follow Julie's blog and LOVE her shop. Thanks for the giveaway! Love those purple flowers. I love that bundle! I really don't think they're colours I'd have chosen, but they look fabulous together. I love that bundle! The whole thing just makes me smile. Thanks! And I am a follower. On to 2000 followers. Mush! What a great giveaway! Julie provides awesome service - I bought from her once and dedicated a whole bloc post to the experience, lol! Love the bundle. Thanks for the chance to win! And I follow yours. Good luck everyone! Definitely the one with the dragonflies I just love them, thanks for the giveaway. They are all great but I'm drawn to the two Reflection Yoshino fabrics. Thanks for the giveaway. The dragonflies! I have seen them in person and they are awesome. I follow Julie - she's got great taste in fabric, that's for sure! Yihaa - I´m a follower! Oh - I really do love those dragonflys ... but the complete bundle has got lovely fabrics!! I do love the dragonflys! The orange fabric makes me happy! Gorgeous fabrics!! I love the fourth one from the bottom but it was tough to choose a favourite! Yes I follow Julie ...doesn't every one!! My favorite is the orange dragonflies and the purple flowers, but really love it all! I love the dragonfly print - great anchor for the bundle. Thanks for a great giveaway!!! I follow your blog... so happily. Thanks for the inspiration! I follow Julie's blog, too! Thanks for the extra chances to win! I love the addition of that purple to the tried and true orange/aqua combo. And while I have been following you for months, I have just made it official. I just love the orange fabrics...it is my infatuation colour! I have been following you through Google reader for ages! Yeah the dragonflies! Those are great. I don't think I've seen those before. I follow The Intrepid Thread! wow, gorgeous colors in that bundle. I'm especially enamored with those plum colors. I follow the Intrepid Thread too. Very Pretty! I love those Good Fortune prints! This bundle is great. I love pairing with aqua! I love your blog and follow it faithfully!! All the prints are wonderful. But the little dragon fly print is my favorite! And a new follower of The Intrepid Thread. I love Julie's blog and follow it faithfully also!! My favorite print from the bundle is the dragonfly print. What a great giveaway. I love this giveaway! Thanks so much! I'm a follower--enjoy seeing all the pretty things you do! The pink-puplish dots one? What a beautiful bundle, it's hard to choose just one. I am also a follower of The Intrepid Thread. I do love the dragonflies! They are so cute! Thanks for the giveaway. I love the dragonflies. Thank you for the generous giveaway. I do love dragonflies, and purple is my favorite. I am a follower of The Intrepid Thread blog. Julie is the best. I am also a follower of your blog. Thanks to you both for the great giveaway. I love this bundle. Love the dragonflies and these wonderful colors. The orange is great! Beautiful fabric. Thanks for the giveaway. It'd be great to play with some of that fabric. Such pretty fabrics! Great job choosing! I follow you too now! What the what?! I LOVE this bundle! The purple! Swoon! I stalk... I mean, follow, Julie. I am a follower of the Intrepid Thread's Blog. Oh I do love the dragonflies - and anything orange right now! I follow Julie, I am a pest! What a gorgeous bundle. It is hard to pick a favorite but I love the lavender dragonflies print. I love Savannah in peacock. Oh I totally love the purple!!! Yay for beautiful fabrics!!! I like those stylized flowers in both the purple and orange. I think I at least need to add them to my stash! I love the dragon flies and the orange fabrics. Julie is the best. She gives away so much fabric and has a sweet attitude. I have been a follower of Julie's for some time now, she is one of my number one online sources for fabric. I love the dragonflies too. My g-baby loves dragonflies so I'm making her a quilt featuring them. Thanks for hosting the giveaway. just started following the Intrepid thread blog, but I've been a follower of her shop for a little while, In fact, I'm hoping my most recent purchase arrives today. She has great prices & the friendliest of service! I follow the Intrepid Thread. Love her blog and all the giveaways she sponsors! I'm a new follower. Thanks for hosting the giveaway. I love the colors in general. But in particular, I love the dragonflies with the orange wings and the lovely orange flowers just above! And of course I follow The Intrepid Thread blog... who wouldn't? And I follow your blog as well, my dear! Thanks for the giveaway opportunity! I love the dragonflies - can you tell me what fabric that is? Even if I don't win, I think I need to buy some!!! I am a follower of The Intrepid Thread! 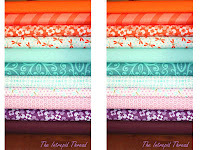 LOVE THESE FABRICS-MY FAVORITE IS THE ORANGE DRAGONFLY ON WHITE! I love the orange and aqua colors esp the dragonflies. I like several other, what's the name of the dragonflies? ALREADY FOLLOW THE INTREPID THREAD!